Welcome to another Top Ten Things here at Enuffa.com! Today we're talkin' about one of the most legendary rock bands of all time, the psychadelic quartet from southern California who emerged in the late 60s with a unique sound, poetically contemplative lyrics, and one of the best, most charismatic front men to ever hold a microphone. It's the ten best songs by The Doors! 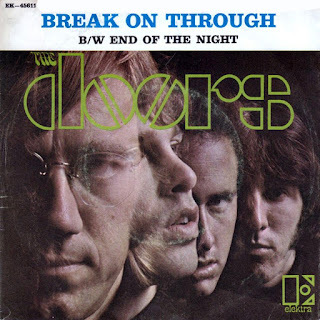 I first got into The Doors mostly thanks to the 1991 Oliver Stone biopic; I had been familiar with a couple of their well-known songs but never really took the time to sit down for a thorough listen until after seeing Val Kilmer's force-of-nature performance as the troubled rock crooner. After seeing the film I went out and bought the double Best Of album, maybe the best compilation of any band's greatest hits. Instead of simply being assembled in chronological order the song sequence has a flow to it. Anyway I listened to that album ad nauseum for years and only within the past decade did I familiarize myself with the rest of the Doors' catalog. This was a thinking man's rock band with a diverse set of influences that, despite its fairly short run, left an indelible mark on the music industry, inspiring generations of artists and musicans. I first heard this song in cover form in the movie The Lost Boys, courtesy of Echo & The Bunnymen. I was drawn in right away by the bouncy feel, the honkytonk piano, and the soulful vocals. 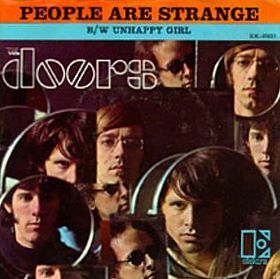 It wasn't until a few years later that I heard the original, but "People Are Strange" remains one of my favorite Doors tunes for the reasons above. Its theme of being an outsider, a stranger in a strange land, sum up Jim Morrison's personality pretty well I think. He marched to the beat of his own drum and music was his outlet in dealing with loneliness. The gang vocals in the final chorus seem to illustrate the idea of other outsiders finding solace in each other, unifying to take on the world. 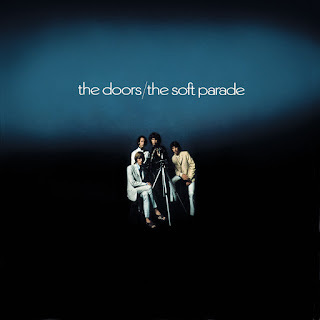 The Soft Parade might be my second-favorite Doors album, after the self-titled one. It's just such a weird left turn, with the addition of strings and horns on nearly every song and major stylistic departures from the band's trademark sound. 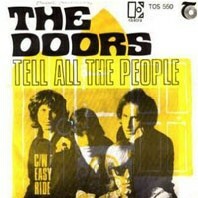 Case in point the opener, "Tell All the People," a symphonic rock anthem with dense horn kicks and vocal harmonies (a rarity for a Doors tune). This song sets the tone perfectly for an album that goes into very unexpected places and shows a band experimenting like crazy. 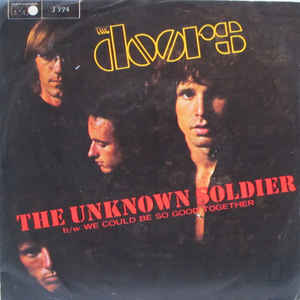 Jim Morrison's sound poem about the Vietnam War and its round-the-clock news coverage, "The Unknown Soldier" features drastic dynamic changes and unusual sound effects to create a grim atmosphere. The song goes from sullen eulogy to midtempo rocker to military march to double-time climax. This is one of the band's most redolent and atpyical tunes. But the title track off the fourth album has to be their strangest song of all. "The Soft Parade" is an 8-minute, multi-section suite that's all over the place musically (Is that a harpsichord??) and features Morrison's most bizarre lyrics. Like John Lennon did with "I Am the Walrus," Morrison seems to simply be playing with words that conjure weird imagery, the songwriting equivalent of Salvador Dali ("Catacombs/Nursery bones/Winter women growing stones"). This epic track is the perfect summation for The Doors' most adventurous album. One of the band's most classic and enduring songs is this straight-up blues rocker featuring a harmonica solo, a tack piano (a piano with tacks stuck on all the hammers, giving it a sharp percussive sound), and Morrison's devil-may-care lyrics about "letting it roll all night long." You can't get much more rock n' roll than "Roadhouse Blues." The final song on Jim Morrison's final album with the band, "Riders" has to be their most atmospheric track. Peppered with thunderstorm effects to underscore its haunting, meditative tone, the song's lyrics touch on nihilistic, foreboding themes ("Into this house we're born/Into this world we're thrown;" "There's a killer on the road/His brain is squirmin' like a toad"). 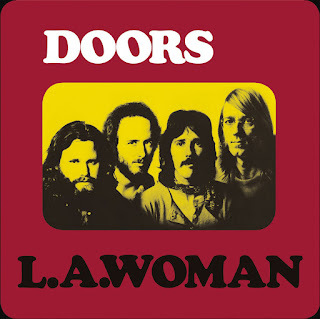 The song's arrangement is driven by Manzarek's mellow organ riff, while Morrison's vocals play call-and-answer with Krieger's bluesy guitar. Just a superbly dark bit of pscyhadelic rock. The first song off their first album, what better way to introduce the world to this philosophical rock n' roll band? John Densmore's bossa nova beat sets the tone for something unusual, Ray Manzarek's organ riff gives the song a foundation, Robby Krieger's guitar adds a raunchy blues element, and Jim Morrison's crooning vocals soar over the whole proceeding, encouraging the listener to tear down metaphorical walls and ascend to a greater understanding of the universe. This is one of the band's most high-energy entries and I'm not sure any other mainstream song more explicitly incites the use of mind-altering chemicals. "Break on Through" probably encapsulates The Doors' philosophy more than any other. 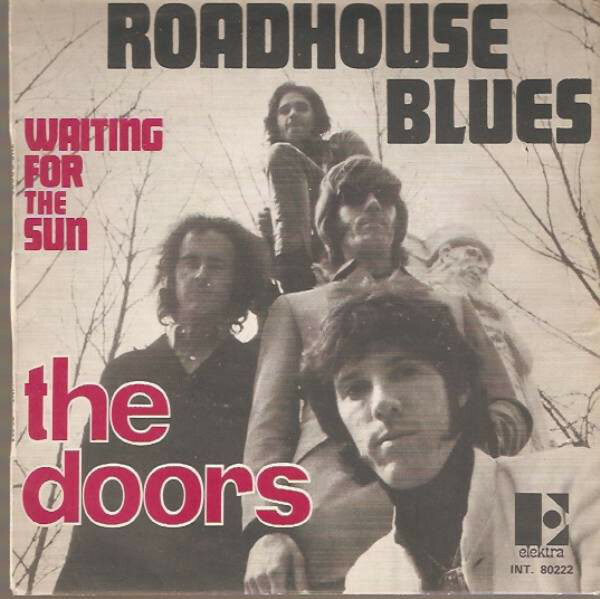 The gateway Doors song for me (and probably many others), this unlikely 7-minute single opens and closes with a double verse/chorus structure and features an extended organ/guitar solo in the middle. Robby Krieger's unusual chord changes, Ray Manzarek's snaky organ signature in the intro and outro, and John Densmore's latin-influenced drum pattern make this tune wonderfully quirky; a perfect mix of each musician's style, and it's long been the band's exemplary track. 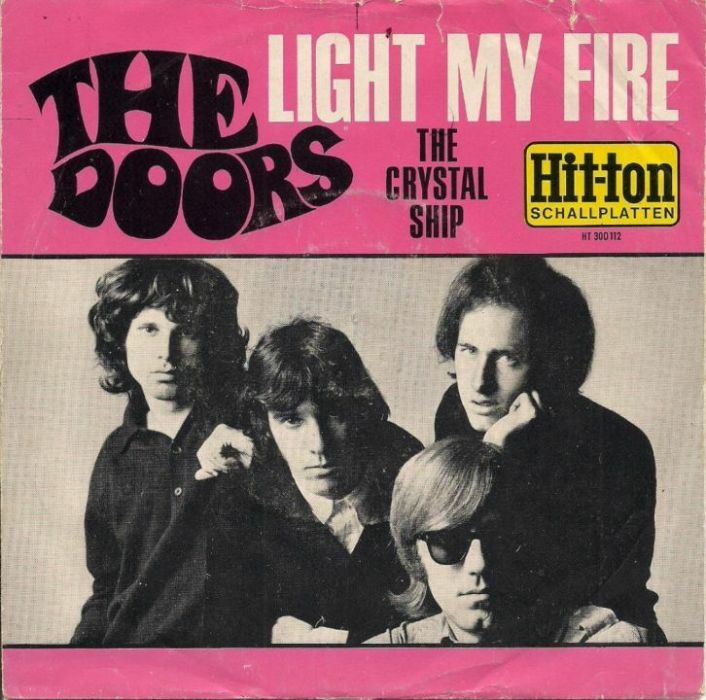 Infamously The Doors performed the song on the Ed Sullivan Show but Morrison failed to change the line "Girl we couldn't get much higher," getting the group banned from the show. Morrison's atmospheric, epic poem featured so heavily in Apocalypse Now somehow never gets old for me. Its 12-minute running time cruises by, as Jim begins singing seemingly about death ("My only friend, the end") and then weaves abstract word imagery ("Ride the snake to the lake") before settling on the (at the time) controversial Oedipal pinnacle ("Father, yes son, I want to kill you/Mother, I want to...."). 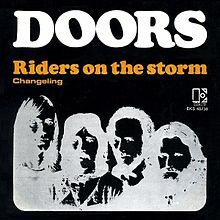 The song surges organically, ebbing and flowing with Morrison's vocals, and I especially love Robby Krieger's legato guitar work in the opening and closing verse. 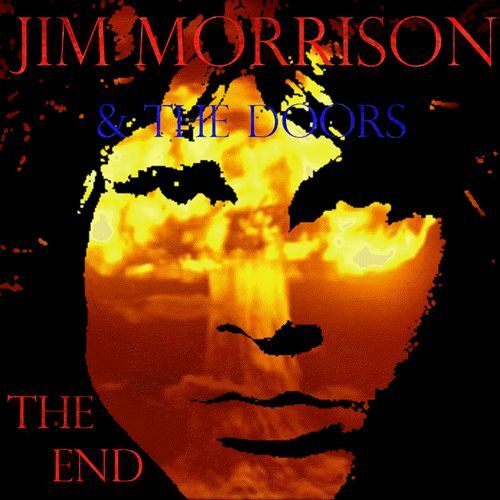 "The End" is probably the most evocative of all Doors songs. I'm not sure what it is about this song. I can't exactly put my finger on why it's my favorite Doors tune. Maybe it's the bouncy groove. Maybe it's the bluesy attitude of Morrison's vocals. Maybe it's the "Mr. Mojo Risin" build in the bridge. I'm not sure. But I desperately love this song; whenever it begins I strap myself in and let it take me on a journey. It conjures images of barrelling down the highway on a hot summer evening without a care in the world. It conveys such a blithe atmosphere, meandering from one section to the next, taking its time to get where it's going; a band just having a great time jamming out. It's like an exclamation point on this band's brilliant but fleeting career, a swan song for the foursome's mercurial frontman. For me "L.A. Woman" is The Doors' finest track. 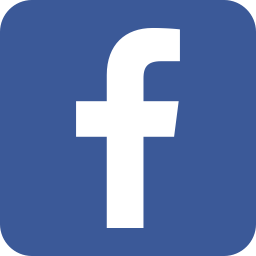 That's it for this edition - thanks for reading, and don't forget to join us on Facebook, Google+ and Twitter (@EnuffaDotCom)!